Word 2013 – How to Get the Number of Words, Characters, Lines and Pages from Word Document? 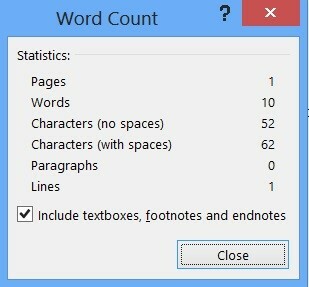 There are times when you want to count the number of words, characters, lines and Pages from a Word document. Microsoft Word 2013 provides one of the easiest ways to get the above information quickly. How to Get the Number of Words, Characters, Lines and Pages from Word Document in Word 2013? 1. Launch Microsoft Word 2013. 3. in the status bar (bottom of the word document), click on the place where it shows “<N> of <N> words”. 4. This will display a Dialog which will show the Word count along with all the other necessary information.